From left: Calvin Leon Smith, Libby McKnight, Toney Goins, Michael Hahalyak, Brittany Bradford, and Daniel Davila in a Cymbeline rehearsal. 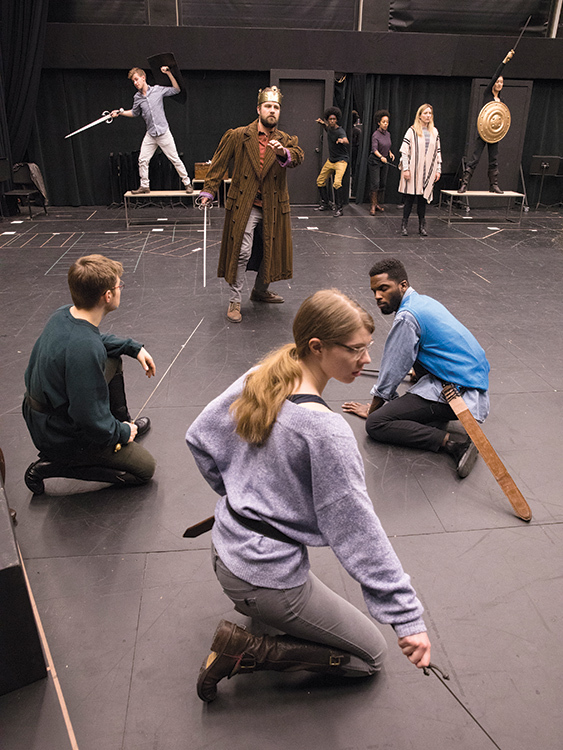 Manon Gage and Nick Podany in a rehearsal for Henry V.
Director Jenny Lord (far right) giving feedback to the Cymbeline cast. The culminating event of the third-year drama program is the Shakespeare repertory cycle. This year's bill includes two plays about British kings. Cymbeline, directed by Jenny Lord, is based on legends about Roman Britain and has been variously characterized as a tragedy, a romance, and a comedy; like all Shakespearean plays it has elements of all three. Henry V, directed by Rebecca Guy, is largely about the Battle of Agincourt, one of the greatest English military victories. Below is one of the play's most famous speeches, in which King Henry exhorts his men to charge once more despite the terrible losses they've already suffered. Manon Gage (foreground) and Michael Hahalyak (with crown) in Cymbeline. Whose blood is fet from fathers of war-proof. That you are worth your breeding; which I doubt not. Straining upon the start. The game's afoot.